when he emerged winner of the Don Jazzy Enigma Beat competition and also produced the beat for the Nigerian BET Cypher. His "I have a dream" single gained massive airplays when it hit the web. The video has been shot and the word on the street is that it's one like no other. Watch out for it. RooftopMcs Sokleva and Soul snatcha is known for putting Jesus on display through their lifestyle and their music. Two years ago, the duo made history by giving 500,000 copies of their album to fans for free. They ventured into the music scene in 1999 and have since been a force to reckon with. 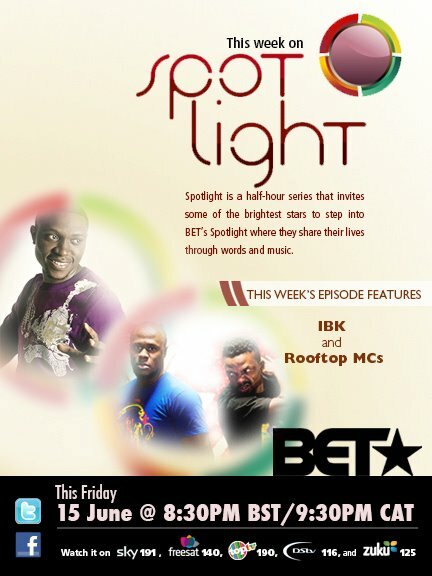 SPOTLIGHT with IBK and Rooftopmcs will be aired on Friday, June 15, 2012 at 8.30PM BST on BET (Dstv Channel 116). Don't miss it!